Tipard M2TS Converter, intuitive and professional M2TS file Converter, makes it available to convert M2TS to iPod, iPhone, etc., or convert M2TS to WMV, AVI, MP4, HD videos and more. This M2TS Converter also provides the flexibility to achieve any video format from MTS, TS, MPG, MPEG, MPEG2, etc. 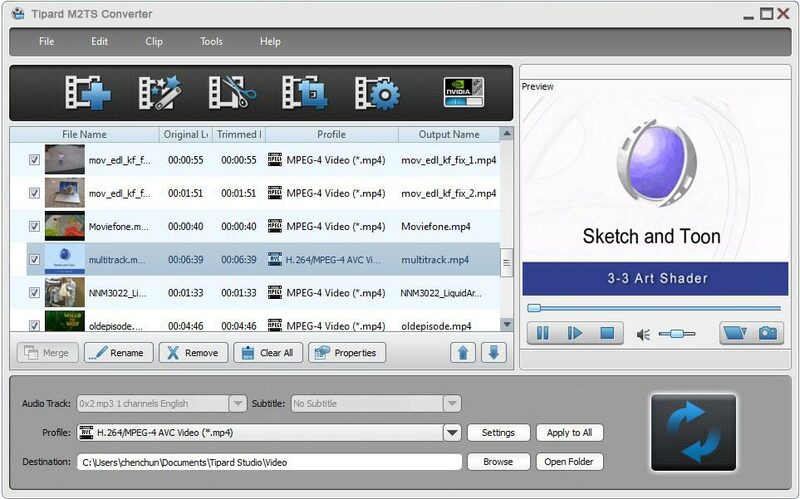 Comprehensive video editing functions are added in the M2TS Converter, like movie joining, movie cutting, video watermarking and movie cropping for you. Tipard M2TS Converter, intuitive and professional M2TS file Converter. ...... Plus, with newly adopted NVIDIA CUDA technology and multi-core CPUs supporting technology, the converting speed is 6X faster now. Tipard M2TS Converter supports broad HD videos and general videos, like convert M2TS to other video/audio formats that your iPod, iPhone, and other players compatible, convert MTS, TS, MPG, MPEG, MPEG2, SWF, FLV, DivX, XviD, QuickTime Video, DV, MJPG, MJPEG, MPV, etc. Using Tipard M2TS Converter, you can get music from videos, and convert among AAC, AC3, AIFF, AMR, AU, FLAC, MP3, M4A, MP2, OGG, WAV, WMA audios. Qweas is providing links to Tipard M2TS Converter 6.1.16 as a courtesy, and makes no representations regarding Tipard M2TS Converter or any other applications or any information related thereto. Any questions, complaints or claims regarding this application Tipard M2TS Converter 6.1.16 must be directed to the appropriate software vendor. You may click the publisher link of Tipard M2TS Converter on the top of this page to get more details about the vendor.